...Each day begins with boulders! This is real easy so far!... ...now, if this rock will just roll into place! 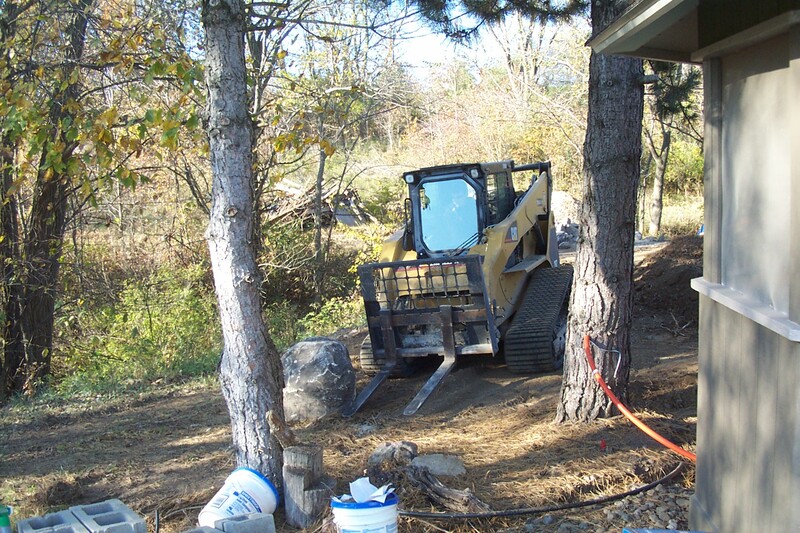 Be sure to click on the following photos to see what it's like to work with large boulders. How to install Boulders - really BIG boulders! While staying out of the way, I direct the unloading of another load of boulders. 24 tons in a few seconds! 004 One of the many project directors! Yup, that's what we need on this project - lotsa directors and no workers! 006 Captain! We have a run-away! This is a great picture! A two thousand pound boulder running away from the loader. There is a fifteen feet deep ravine just feet away... And we retrieved a few from it's depths with large nylon trucking ropes!